Twenty percent of the world’s calories come from wheat, according to the United Nations – a larger share than any other single food. Ever since our distant ancestors discovered that this grain could be mixed with water, left to ferment, then baked to airy, crusty perfection on hot rocks, wheat has been a cherished staple of diets around the world. And yet a few popular diet books like Wheat Belly and Grain Brain now advise us to “Just Say No” to wheat, cutting it completely from our lives. In today’s blog, we’ll take a closer look at some of the ﬁctions in these fad books and some interesting facts about modern wheat. “Our wheat is GMO” — Nope. It’s widely believed that today’s modern wheat is GMO (genetically modiﬁed). It’s not. In fact, US wheat farmers have been the loudest voices ﬁghting against the introduction of any GMO wheat. (Here’s a 2010 article, in Reuters, that reports this concern, for instance.) Half the U.S. wheat crop is exported – and any GMO wheat in our food supply would dry up sales to other countries. “Today’s wheat is higher in gluten” — Nope. Glutens are proteins in wheat (and barley and rye) that help it stretch and rise into crusty loaves of bread. The wheat-naysayers claim that modern wheat has been bred to contain higher levels of gluten. Donald Kasarda, a researcher with USDA, reviewed data going back more than 100 years, and found no evidence that gluten levels have risen in wheat. “We’re simply eating more wheat than ever” — Nope. 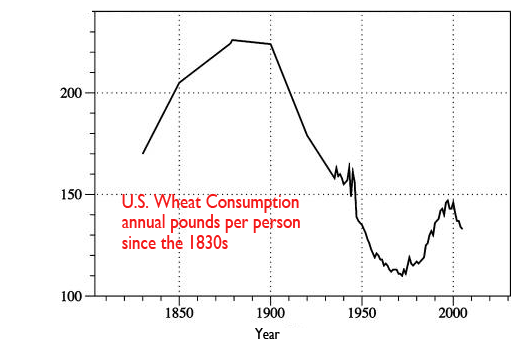 “Wheat is the main reason we’re overweight and obese” — Nope. Wheat makes an easy scapegoat, but other countries with much higher per-capita wheat consumption have much lower rates of overweight and obesity. (The French, for instance, consume nearly twice as much wheat per person as Americans, but have about one-third our obesity rate.) Weight problems are almost never the fault of one food; it’s total diet and lifestyle that matter. Go ahead and enjoy your whole grains, especially in their intact and traditional minimally processed forms, in the context of a diet overﬂowing with fruits, vegetables, legumes, ﬁsh, olive oil, and other health foods. A whole grain cookie (even a gluten-free one) is still a cookie. “Pasta sends your blood sugar spiking” — Nope. One of the very cool facts about pasta is that it has a low glycemic index, due to the way the pasta extrusion process rearranges the starches in the wheat. Cook it al dente, top a small portion with healthy “partners” like vegetables, olive oil, tomato sauce and beans, as traditional cultures have done for centuries, and you have a very healthy meal. So why are people singling out wheat? Wheat and gluten intolerance are on the rise, and of course it’s important to ﬁnd out why. I recently attended the International Celiac Disease Symposium in Chicago, to learn more about this important topic. Here’s one of the thoughts I came away with, from this top-level international scientiﬁc conference: Imagine that all your life you’ve been able to run marathons. Sure, it’s diﬃcult, but you stay in shape and your body is up to the challenge. At some point as you age, though, you just can’t handle 26.2 miles anymore – not because the marathon has changed in any way, but because you have. Some people suspect that eating gluten (and therefore wheat) is like that. The complex gluten proteins are extremely challenging for our bodies to digest, but when we’re healthy, 99% of us can consume gluten without any problem. When our digestive system is already compromised by antibiotics, stress, inﬂammation and a steady diet of processed food, however, some of us discover we’re no longer up to the challenge of digesting gluten. It’s not because the wheat has changed, but because we have. Don’t shoot the messenger! Cynthia, you knew I would challenge this. When did the % of celiacs increase from .7% to 2%? I know that Mayo clinic study of the Warren AFB said celiac increased fourfold but when did the actual count change? Secondly, I have never seen any information to support the claim that amylase and trypsin inhibitors were intentionally bred into hybrid wheat. As a matter of fact, I contacted some PhD friends in Cereal Grain Chemistry and asked about protease enzyme inhibitors in wheat probably not more than 7 years ago. They confirmed that there were amylase inhibitors but protease. It was only after a read a research paper from a young lady working at the wheat research lab in Manhattan Kansas that my suspicions were confirmed. I called her and discussed that and she told me that she and 3 wheat breeders were embarking on a project to increase the protease inhibitors at which point I told her she may want to think about that. She asked why and I told her that we digest food with enzymes as well. Her response was; Oh my god; I never thought of that! Don't give the wheat breeders so much credit; with them it is rolling the dice. Hi Don, Not sure what you're referring to when you say .7% vs 2% -- the only percent I refer to on this page is 1% (when I say 99% of us are not celiacs). All figures on celiac disease are estimates anyway, since so much of it still goes undiagnosed. The information on ATIs came from Dr. Detlef Schuppan. This study (http://www.ncbi.nlm.nih.gov/pmc/articles/PMC3526354/) discusses ATIs and says "more recent breeding of high yielding and highly pest-resistant wheat (Ryan, 1990; Cordain, 1999; Sands et al., 2009) has led to a drastic increase of ATI content (Ryan, 1990)." Hi Liz, We're not doctors, so we can't comment on individual diagnoses. Physicians and dietitians recommend various diets for a number of different reasons. However, just because a gluten free (or dairy free, etc.) diet works for one individual, doesn't mean that it will work for others -- these diets are often medically recommended for specific reasons, for specific individuals. I hope this helps.